Callanwolde Fine Arts Center has been a hub of cultural and social activity in Atlanta since 1971. 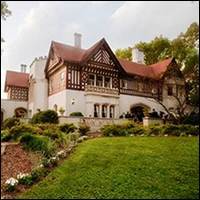 It is housed in the magnificent Gothic-Tudor mansion situated on a beautifully landscaped 12.5-acre estate that was built in 1920 by Charles Howard Candler, oldest son of Coca-Cola founder Asa Candler. Thriving today as a busy non-profit community arts center, Callanwolde offers classes and workshops for all ages in the visual, literary and performing arts. Special projects and events are presented throughout the year, as well as gallery exhibits, outreach programs, fundraising galas and much more.